I'm going to be honest with you all right now: I have extremely short legs. I know, I know but don't be sad for me my loves because although I only stand at about 5'1 (on a good day), I love baring my legs with a fantastic pair of heels just like the rest of you tall beautiful women! That's why I am personally happy that Pnina Tornai has created so many gowns where, if I wish, I could show some leg when it comes to a wedding, reception, rehearsal dinner, bachelorette party, etc. I know to some that may seem a bit risqué but don't worry, there are many different ways that you can show off those gorgeous gams on your special day. 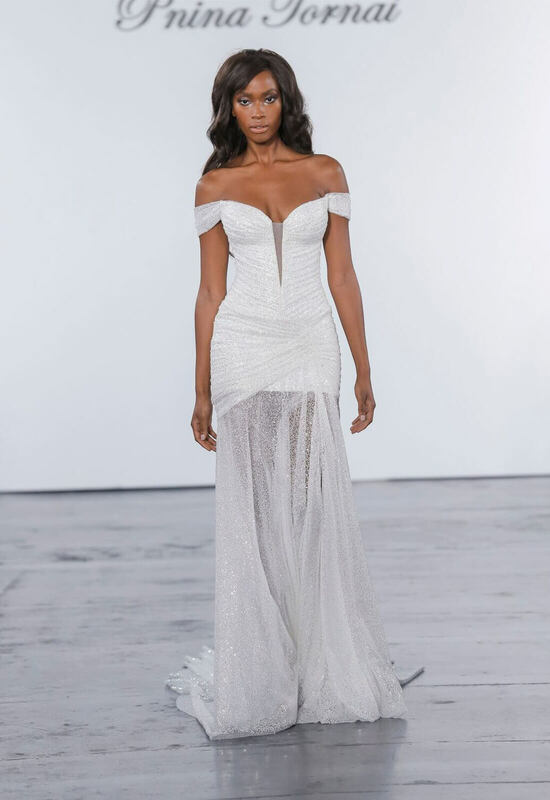 Now personally, I prefer to be a little daring, so I am currently obsessed with the romper-meets-skirt gown that Pnina Tornai just came out with for her new Fragile Collection. However, if you would prefer to be more modest there are some lovely high-low gowns in the Dimensions Collection that would also show off your legs nicely. Or, if you prefer a mini dress, that is always a fun and flirty way to go for your reception or your bachelorette night out with the girls. Pnina Tornai has also designed plenty of wonderful gowns that give you the best of both worlds where the gown is short underneath but then has a sheer overlay so that guests can still get a peak of your fabulous legs. No matter which gown style you choose to display those lovely legs of yours, wear your gown with confidence. Making our brides feel confident and beautiful on their special day is our number one priority. So strut your stuff down the aisle like it's your own personal runway and strike a pose as you own your wedding day look!